A 16-year-old boy, who is on the Mishawaka High School football team, was arrested Sunday in the killing of his schoolmate, Breana Rouhselang. MISHAWAKA, Ind. -- An Indiana high school football player told investigators that he killed a 17-year-old schoolmate because he was angry that she waited so long to tell him she was pregnant with his child that it was too late to get an abortion, authorities said Monday. 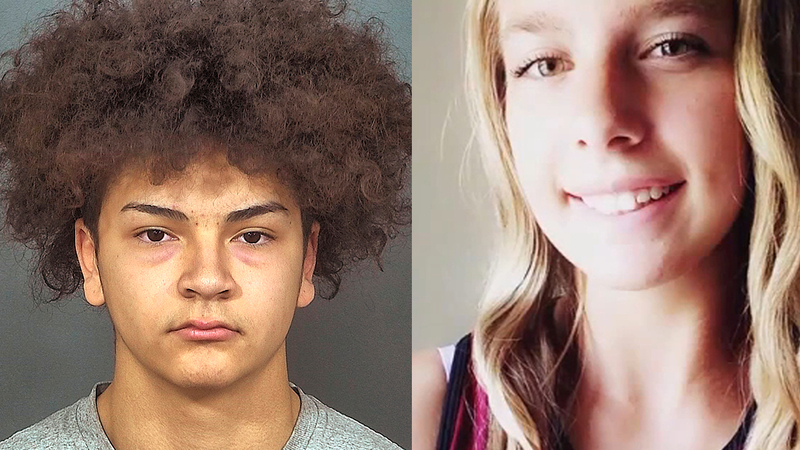 Aaron Trejo, 16, was charged as an adult with murder in the Sunday killing of Breana Rouhselang and the fetus. He was arrested Sunday, scheduled to be arraigned Tuesday and had no attorney on record. In a court filing supporting the charges, prosecutors say Trejo told police that he stabbed Rouhselang during a fight over her pregnancy and that he put her body in a restaurant dumpster in their hometown of Mishawaka, which is next to South Bend and about 80 miles (130 kilometers) east of Chicago. After disposing of her body, Trejo recounted walking to a river and throwing her phone and the knife he brought from home as far as he could into it, police said. Trejo told investigators he had been planning the killing for about a week and hadn't told anyone. Rouhselang, who was a manager of the Mishawaka High School football team, was last seen at her home at around 11 p.m. Saturday. Her family called police about 4:30 a.m. Sunday after they "got the feeling that something wasn't right," said Lt. Alex Arendt of the St. Joseph County Metro Homicide Unit. An autopsy determined that Rouhselang died from multiple stab wounds and that a scarf had been tied tightly enough around her neck that strangulation was occurring before she died. Her stepmother, Nicole Rouhselang, told reporters Sunday that Rouhselang had been a softball coach, cheerleader and football team manager at the school. She also said her stepdaughter was about six months pregnant when she died. Indiana generally doesn't allow abortions after the 20th week of pregnancy. "I've known her since she was 6," she said. "I just don't understand it." Mishawaka schools Superintendent Dean Speicher said some of the high school's 1,500 students took part in a silent vigil Monday morning to honor Rouhselang. Speicher said Rouhselang and Trejo had attended schools together since elementary grades, but he didn't know any details about any relationship between them. "They've known each other long before they came together - she as a manager and he as a football player - at Mishawaka High School," he said. Speicher said he didn't know of any previous violence between the students. "To our knowledge there were no signs, everything appeared to be very normal," he said.